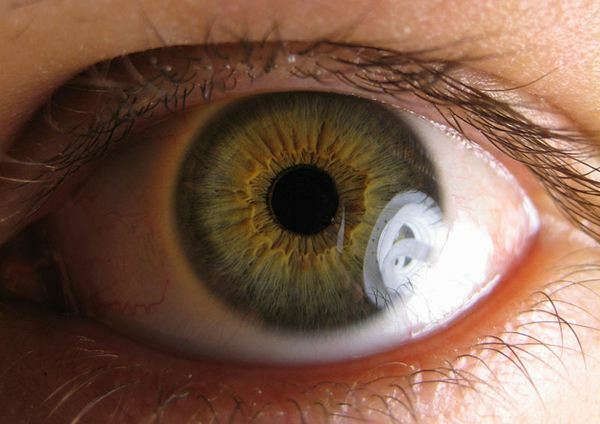 A blind spot is a small area that is completely without vision, and everyone has a natural blind spot, located on top of the optic nerve inside the eye. This might not be immediately visible or noticeable, as what one eye lacks, the other will compensate for, and the human brain has the tendency to fill in any gaps in what we might be seeing. However, by covering one eye, you can discover your natural blind spot, which will make it difficult for you to see things that are directly in front of you. The natural blind spot can also be exploited in order to create optical illusions. Get a piece of plain white paper and pin it onto a wall directly in front of you. Make sure the paper is not lined, and does not have any creases or spots on it, as these will come in the way, and obstruct you from discovering your blind spot. Then, face the piece of paper directly, and using your left hand, position your index and middle fingers so that they are roughly as far apart as the natural distance between your eyes – for this purpose, you will need to hold them up to your eyes, to measure the distance. Then, keep them the same distance apart, and place them on the page. Keep your fingers there, and with your right hand, pick up a black marker and mark an X over the area where your index finger is, and an O over the area where your middle finger is. Do not make the X and O too large or too small in size – they should be roughly less than a square centimetre. Now, remove your left hand, and hold the piece of paper in your hand. Hold it at arm’s length, and close your left eye. Then, look at the X using only your right eye. Focus your eye on it, and then slowly start bringing the paper closer to your face, all the while keeping your right eye fixed on the X. The point where the circle disappears from your sight is your blind spot – this will generally be when there is roughly 20-25 cm of distance between your eye and the paper.